E!’s addictive drama The Royals will return on March 11, 2018, as just confirmed by the network. The fourth season will air on Sundays at 10pm ET/PT, with the new season consisting of 10 one-hour episodes. The announcement of the season four premiere date was accompanied by a 30 second teaser trailer that doesn’t really give anything away about the upcoming season. In addition, the announcement revealed the show’s digital companion series, The Royal Hangover, will also premiere on March 11th. 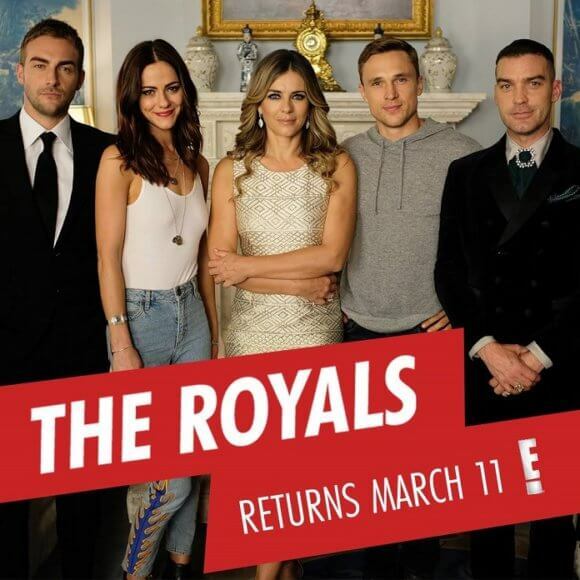 Returning The Royals cast members include Elizabeth Hurley as Queen Helena, William Moseley as Prince Liam, Alexandra Park as Princess Eleanor, Jake Maskall as Cyrus, Max Brown as King Robert, Tom Austen as Jasper, and Genevieve Gaunt as Wilhelmina. The series is executive produced by Brian Robbins, Joe Davola, and Shauna Phelan. The Plot: The 10 episode one-hour season involves unexpected twists and intriguing complexities, revealing the intricacies faced by royals trying to maintain high-profile relationships under scrutiny, and continuing to shine a light on the anarchy in the monarchy. The fourth season of The Royals picks up after the charming, potentially duplicitous, Prince Robert (Max Brown) is crowned King of England. Prince Liam (William Moseley) and his recently dethroned uncle Cyrus (Jake Maskall) form an unlikely alliance, Queen Helena (Elizabeth Hurley) struggles to control her unruly brood as she figures out her role in the palace. And, after a heated on again-off again relationship, bodyguard Jasper (Tom Austen) tries to capture Princess Eleanor’s (Alexandra Park) heart one more time just as they are about to face their biggest obstacle yet. A Look Back at Seasons 2 and 3: Season three picked up two weeks after the execution of King Simon’s murderer, Ted Pryce, the former head of the Royal Family’s security. While vigilante justice appeared to be served when an angry mob took matters into their own hands and ended Ted’s life after he robbed them of their beloved King Simon, the royal family still struggled to reestablish themselves as worthy leaders of their people. Queen Helena was on a mission to prove that Prince Liam and Princess Eleanor are the legitimate heirs to the throne and the children of King Simon. However, Simon’s brother and current ruler of the monarch, King Cyrus, stopped at nothing to ensure the Queen could not prove the twins’ paternity. Meanwhile, twins Prince Liam and Princess Eleanor were at the height of their fame – so far. In fact, a mysterious #KingLiam hashtag took England by storm, calling for an uprising in support of the hero Prince. But Liam was plagued by Ted’s controversial execution, and turned down a dark path to cope with his anger and resentment. Her brother’s seedy behavior went unnoticed by Princess Eleanor who was torn on what to do with her relationship with Jasper. On one hand, she was undeniably in love with him. On the other hand, before he fell in love with her, his plan was solely to seduce her and steal her fortune. Not exactly “perfect boyfriend” material. The news of Prince Robert’s mysterious death shattered his family and the nation alike. Then, in the series’ season two finale, it was revealed that the presumed deceased Prince Robert was in fact still alive. Season three answered the questions surrounding Prince Robert’s disappearance and how his return impacted his siblings, mother, and uncle as the rightful heir to the throne.